Some of the characters that we haven't seen in a while return this week, as a lot takes off for this season. The episode begins with Clarke and Lexa discussing where home is and that they are bringing peace. At Arkadia, Pike speaks to the people, telling them that he wants to make Arkadia self-sufficient and safe. He also announces that those who fight him will die. Characters could be fighting against the law like the way some, specifically Abby, did in season 1. Clarke and Lexa discover the hundreds of dead bodies. It turns out that Indra is injured, and she is with the dead ones. Indra explains what happened to Clarke and Lexa, and that Bellamy was the only one who wanted to spare the wounded. Lexa's reaction is immediately to anger, but Clarke wants to find a way to fix this. Kane recruits Octavia when Indra signals him. Bellamy doesn't agree with all of Pike's ideas, so he talks to him personally. He tells him to think about the lives saved, not the lives lost. Bellamy runs in to Kane, and Bellamy says that the grounders started the war. Raven is upset because she can't work. Lindsey Morgan's acting in this scene is fantastic, you can really see Raven's pain on her face. Jaha and a grounder arrive at Arkadia. The grounder that is with them gets killed. Jaha tells Abby that "death is not the end." Murphy and his girlfriend steal from a man. Jaha tells Abby and Kane about the City of Light and they are very cynical about it. Jaha talks to Pike, and he says that he wants to free his people. He sees ALIE as he talks. Octavia arrives at where Clarke, Lexa, and Indra are at. They come up with a plan of how to get Clarke into Arkadia to persuade Bellamy who will have influence on Pike. Murphy and his girlfriend talk. She wants to go after her brother. The sick grounders are being removed from camp. Lincoln fights people because of this, and gets kicked out of camp. Jaha tries to convince Raven to believe in the City of Light, as I worry that Raven is going to get dragged into the show's worst storyline. 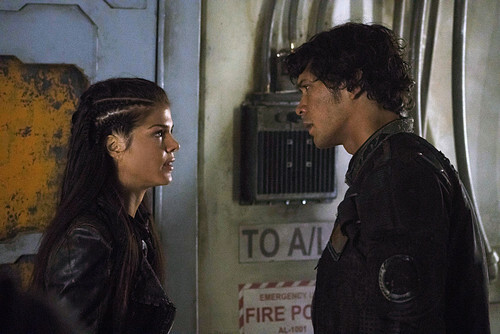 Octavia and Bellamy get into an argument, and it is really intense. She leads him to Clarke. Clarke says that she needs to talk to Bellamy. Clarke tells him that the problem was solved, as the Ice Queen has died. He says that they have been at war since they landed. He says that people die when Clarke is in charge. This scene is really intense. It looks like things are working out, then Bellamy handcuffs Clarke. I think that some of these things that Bellamy is doing are really stretching who he has become. Jaha goes after Raven again, trying to bring her to the City of Light. Raven becomes angry because everyone wants to make her feel better. Again, I must point out how fantastic of an actress Lindsey Morgan is. Truly one of the best on TV. Octavia attacks a guard, and tells Bellamy to let Clarke go. Clarke frees herself, and she and Octavia go to escape. They talk to Abby and Kane, and it is a great, very intense scene, probably the best in the episode. Octavia suggest that they change how they do things. The girlfriend returns to Murphy. This time, his stunt goes wrong, and he is threatened with death. The key to the City of Light falls to the ground, and they want to know where he got it. Indra tells Lexa that the only way to win is to use their guns. Clarke tries to convince Lexa to change the way she does things, because blood must have blood results in everyone dead. Lexa decides to go with Clarke's plan, because that will result in peace. Lexa then questions Indra's loyalty to her. Many of the major statements in this show later get countered. In season one, Bellamy said "we are grounders", but Clarke later said "we are not grounders". Similarly, Lexa has been saying "blood must have blood", but now she believes "blood must not have blood". Raven meets ALIE, and I am not excited about this. Don't sacrifice the best character to the worst storyline! This episode was much weaker than last week's fantastic episode, but it was still a good episode. What did you think of "Hakeldama"? Leave your thoughts in the comments!